Imagine if the Oregon Trail was a board game, but your settlers didn’t get dysentery all the time. In many ways, that’s Settlers of America. This game uses familiar Settlers of Catan rules to simulate America’s westward expansion. The game comes with different colored pieces for four players, resource cards, development cards, and a map of America with Catan hexes. The purpose of the game is to build cities and deliver your supplies to other player’s cities. City locations are already marked on the map, corresponding to prominent American cities. To build a city, you have to start with a settler. Players use resources to move settlers to undeveloped cities and they build a city there once they arrive. There’s no additional cost to turn a settler into a city. Players then build railroads to connect cities and deliver supplies. Your railroads must start from your own cities, but otherwise your cities aren’t too important for you. They’re really important for the other players, since they’ll need destinations to deliver supplies. However, each time you build a city, you unlock another set of supplies. So if you want to win the game, you have to build cities first. Some hexes have printed numbers, while others have question marks. You put a number token randomly on a question mark hex as it’s developed. However, there aren’t enough tokens for every question mark. As new hexes are developed westward, the tokens are taken off of eastern hexes and put on the new hexes. That means you have to go west! If you’re familiar with Catan, these rules will be familiar to you too. That makes it pretty quick to pick up this game. The Robber will be familiar. Rolling for resources will be familiar. The basic pattern of collecting resources, trading, and building will all be familiar. So while this game is different from Catan in noticeable ways, you’re not starting from scratch. The gold is fantastic! One of the worst things about Catan is getting unlucky. How many games of Catan have ended with a frustrated player who just couldn’t get the numbers they needed? In Settlers of America, you get one gold for every turn you don’t collect any resources. Two gold can buy any one resource of your choice. You can also use gold to use other player’s railroads. Gold is great balancer, making sure no turn is wasted. The game captures the theme well. Things are set up well to push players to expand west. There is a tension between cooperating and competing that feels like living on the frontier. Your progress is heavily dependent on other players. If other players haven’t built cities, you can get stuck. Your strategy is almost entirely reliant on what other players do. You might like that kind of game, but to me it was a bit of a turn off. 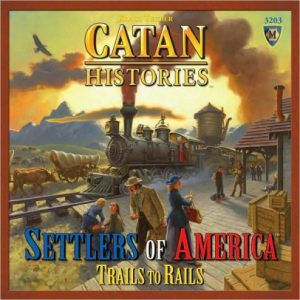 Settlers of America is less randomized than other Catan games. Even though you won’t use every city location in every game, all of those locations are already preset. The resource hexes are preset as well and, while some of the numbers are randomized, many are not. This game is trying to simulate a real point in history, but in doing so limits some of the randomization that I’m used to in Catan and could hinder some of the replay value. 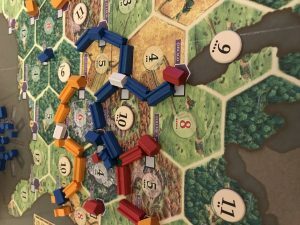 Settlers of America is different enough from Settlers of Catan to have its own flavor while still feeling familiar. Playing this the first time was different enough that I realized most of my Catan strategies wouldn’t work here. But it was familiar enough that I could focus my energy on new strategies and not on grasping a lot of new rules. Even still, this game doesn’t captivate me as much as Settlers of Catan and its expansions do, so I would recommend this game only for the most avid Catan fans. For other players, I’d suggest sticking with the standard game. 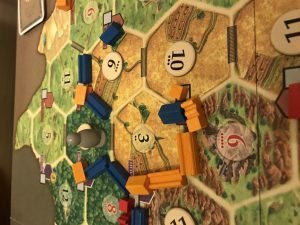 This entry was posted in Articles, Board Games and tagged America, Article, Board Game, Catan, Review, Tom. Bookmark the permalink.